Diagnosis : Known case of CA Thyroid. Thyroid was examined with 7.5mHz probe. Left lobe of thyroid is enlarged and isthmus is thickened. Left lobe of thyroid shows multiple round hyperechoic masses which are joined together. Some of these shows central hypoechoic areas, Suggestive of Necrosis. Right lobe shows a 12x 10 mm hyperechoic nodule in lower pole. Left lobe measures : 80x 35x 40 mm. Isthmus measures : 8 mm. Enlarged thyroid, multiple hyperechoic masses in left lobe are consistant with CA thyroid. (No increase since last USG). Left lobe measures : 80x 33x 40 mm. Isthmus measures : 7.8 mm. (Minimal decrease in size since last USG). Isthmus measures : 7-8 mm. (No Change since last USG). Liver is normal in size and shows hyperechoic echotexture suggestive of fatty infiltration.Intrahepatic portal radicals are normal. No focal lesion. Portal vein =10mms. CBD = 3 mms. Mild splenomegaly. Spleen is 135 mm n length. No Focal lesion. Right kidney measures : 95x 30 mms Left kidney measures : 100x 40 mms. Both kidneys are normal in size, shape, position and echotexture. Corticomedullary differenciation is well maintained. There is no calculus or hydronephrosis. Uterus is not seen due to hysterectomy. FNAC suggestive of thyroid malignancy. Plain and contrast enhanced CT scan of neck and thorax has been done. Multiple sections at 10 mm interval have been taken before and after injection of intravenous contrast. Study reveals markedly enlarged left lobe of thyroid and isthmus measuring 4.9x 2.8 cms. in its maximum transverse dimensions showing subtle low attenuation foci(cystic /necrotic components). Enlarged lobe has extended across the thoracic inlet into superior mediastinum (superioinferior extent of 7-7.5 cms) with the mediastinal component measuring 4.7 x 2.8 cms. Splaing of the mediastinal vessles and marked displacement of trachea to right of midline and posteiorly is noted. Within the lower neck the trachea is displayed to rigth side. The fat interface between the anterior and left lateral wall of trachea and this lesion is obliterated. Fat planes with the adjacent carotid sheath are preserved. Small calcific specks noted within the lesion. There is no evidence of significant lymphnode enlargement in thorax/ neck. Both the lung fields appear normal. There is no evidence of any parenchymal lesion or metastasis. ( Suboptimal lung images are due to poor breath holding of patient). The muscle planes are well maintained. Markedly enlarged left lobe of thyroid with cystic / necrotic foci and a large mediastinal component causing compression / displacement of trachea. The fat interface between the anterior and left lateral wall of trachea and this lesion is obliterated. No significant neck/thoracic lymphadenopathy noted. Lung fields appear essentially normal. Known case of CA thyroid. Left lobe of thyroid is enlarged and isthmus is thickened. Left lobe of thyroid shows multiple round hyperechoic masses which are joined together. Some of these central hypoechoic areas, Suggestive of necrosis. Right lobe shows a 12 x 10-mm hyerechoic nodule in lower pole. Vascular structures and neck muscles are normal. IMPRESSION: Enlarged Thyroid, Multiple Hyperechoic Masses in Left Lobe Are Consistant With C A Thyroid. [Lesion Remains Static]. Margins of the gland are regular. 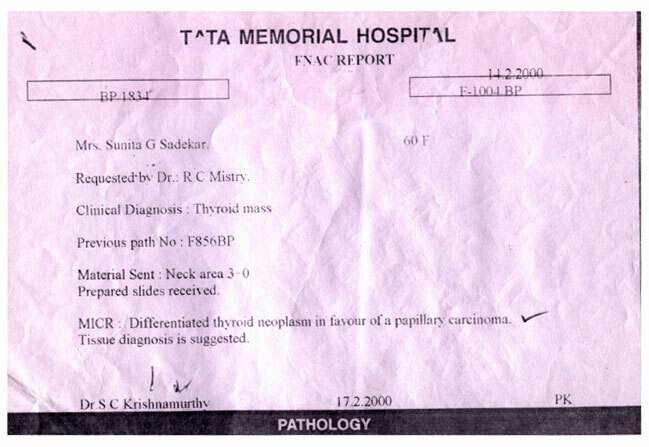 A case of thyroid malignancy previous scan dated 06/12/2000 have been reviewed. Plain and contrast enhancd CT scan of neck and thorax has been done. Present study reveals soft tissue lesion involving the left lobe of thyroid and isthmus extending into the superior mediastinum. This lesion in the lower neck shows maximum transverse dimension of 4.9 x 2.7 cms and within the mediastinum measures 4.6 x 2.9cms. Post contrast study reveals a mild inhomogeneous enhancement pattern with necrotic/ cystic foci. Within the mediastinum the mediastinal vessels and trachea are displaced to right of midline. Within the lower neck the trachea is displaced to right side. The fat planes between the anterior and left lateral wall of trachea and this lesion are obliterated. Major neck vascular structures appear normal. No significant lymphadenopathy is noted in neck / thorax. Mediastinal vascular structures appear normal. Heart and aorta appear normal. No lung parenchymal lesion is noted to suggest metastasis. Bones appear normal. IMPRESSION : Follow up study does not reveal any significant change in size / Appearance / Extent of the thyroid related lesion. No significant neck / thorax / lymphadenopathy noted. Lung fields appear normal. IMPRESSION: Enlarged Thyroid, Multiple Hyperechoic Masses in Left Lobe Are Consistant With C A Thyroid. [No Significant Change]. A case of thyroid malignancy - previous scan dated 26/06/2001 has been reviewed. Plain and contrast CT scan of neck has been done. Multiple sections at 5 mm and 7mm interval have been taken. Soft tissue mass in left lobe of thyroid and isthmus measuring 4.9 x 3.4cms with extension in to superior mediastium (4.9 x 3.7cms) showing mild inhomogeneous enhancement in contrast study. There is compression and displacement of trachea to right side. Vascular structures of neck appear normal. No evidence of cervical Lymphadenopathy.Mediastinal fat planes are well maintained and appear normal. No mediastinal lymphadenopathy. No evidence of pleural effusion. Visualised bones appear normal. No lytic or sclerotic lesion is seen. IMPRESSION : Soft Tissue Mass in left lobe of thyroid and Isthmus Measuring 4.9 x 3.4cms with extension in to superior mediastium (4.9 x 3.7cms) . No significant change in size of the lesions as compared to previous scan report. No evidence of Lymphadneopathy or Lung Metastasis. Case of thyroid malignancy. Previous scan dated 28/12/2001 has been reviewed. CT Scan of neck has been performed. Multiple sections at 5mm and 7 mm interval have been taken. Study reveals soft tissue mass involving the left lobe of thyroid and isthmus measuring 5.1 x 3.0cms with extension into superior mediastnum (5.5 x 3.0cms) showing inhomogeneous enhancement and few necrotic foci in contrast study. Compression and displacement of the trachea is noted to the right side. Vascular structures of neck appear normal. No evidence of obvious cervical lymphadenopathy. Strap muscles of the neck appear normal. Larynx appears normal. Mediastinal vascular structures show normal anatomical disposition. The trachea is central , both the main bronchi are well seen and appear normal. The pre and para tracheal spaces and subcarinal spaces are well seen and appear normal. The mediastinal fat plates are well maintained and appear normal. Both the lung fields appear normal. There is no evidence of any parenchymal lesion. The soft tissues are normal. IMPRESSION : Soft tissue mass involving the left lobe of thyroid and isthmus measuring 5.1 x 3.0cms with extension into superior mediastinum (5.5 x 3.0cms) showing inhomogeneous enhancement and few necrotic foci in contrast study. No significant increase in size is noted as compared to previous scan report dated 28/12/2001. No Lyphadenopathy / Pleural Effusion. Comment : As per as the CT scan , blood reports and clinically too, till today patient is completely under control(10/04/2003).